The July WER report has an up-to-date overview of the FLNG sector. This sector has been hit by the global LNG oversupply and depressed LNG pricing -- which has impacted investment in new land and floating LNG production facilities. We provide details for the two FLNGs completed over the past quarter, profile the six FLNGs now on order and assess whether several of these orders could be cancelled if market conditions do not improve. We then provide details for the Coral FLNG about to be contracted for use in Mozambique, profile 23 floating liquefaction projects now in various stages of planning and assess the likely timing of FLNG contracts on these projects given expected market conditions. 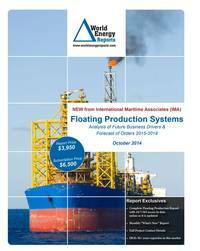 In the data section of the report are details for 241 floater projects in the planning stage, 53 production or storage floaters now on order, 281 floating production units currently in service and 29 oil/gas production floaters available for redeployment contracts. Charts in the report update the location where floating production and storage systems are being planned, operating, being built and to be installed. Accompanying excel spreadsheets provide the report data in sortable format. Information is current as of 22 July.